MicroGrid design begins by understanding the load profile needed to be served by the system. Often, the load is adjusted in the system design by applying energy efficiency measures such as demand response controls, equipment upgrades, and other system adjustments to reduce the overall generation needs. What does not typically happen, however, is a closer look at those loads to determine how much can be served natively by DC power sources. This is a fundamental flaw in optimizing the use of renewable energy resources that supply DC electricity – like photovoltaic, battery, and fuel cell technologies. Instead, the entire load is considered and the resulting power generation requirements are sized accordingly. With some additional thought and separation of the DC loads from the AC loads, the amount of renewable generation required can be dramatically reduced to ONLY SUPPLY DC POWER FOR THE DC EQUIPMENT in the building. In other words, by designing separate DC and AC networks, a building MicroGrid could be developed that minimizes power losses due to transformation or conversion by simply supplying the equipment with the native electricity it requires. So, instead of using 50 rooftop solar panels to supply a building, you might only need 10, driving down system costs and increasing efficiencies by utilizing the best type of power for each piece of equipment being served. The conceptual architecture described in this article proposes a building MicroGrid using a hybrid approach of DC renewable generation resources for DC equipment and the utility grid for AC equipment. An “energy router” acts as the hub that manages electricity across the AC and DC buses and minimizes the need for lossy DC-AC and AC-DC electricity transformations. Figure 1, above, shows the overall building level DC MicroGrid architecture. Because of the power losses incurred with DC power over long distances, this concept is best used in a building level MicroGrid with short runs for the circuits on the system. In reality, calling it a hybrid MicroGrid is probably more apropos, but for the purposes of this discussion, we’ll use the DC MicroGrid terminology to keep it short. The Green Lines represent the DC part of the system, while the Orange Lines represent the AC portion. In typical office buildings, the amount of DC power equipment ranges from 20-30% of the overall load, with those numbers steadily rising as LED lights, computers, more electronics, and electric vehicles enter the equation. The architectural rendering in Figure 1 may not be complete as some DC equipment will require DC-DC transformations from the DC network’s supply voltage, but these transformations are much less lossy than AC-DC transformations and also produce much less heat. The renewable generation supply should be sized to 10-15% more power than required by the DC equipment. This allows for mistakes in the DC load calculations, the addition of new DC equipment, and when there is more DC power than required by the DC equipment, the excess supply can be inverted and injected into the AC system to lower electric utility costs. Inverter power transformation losses normally range in value from 10-24% (90-76% efficiency). 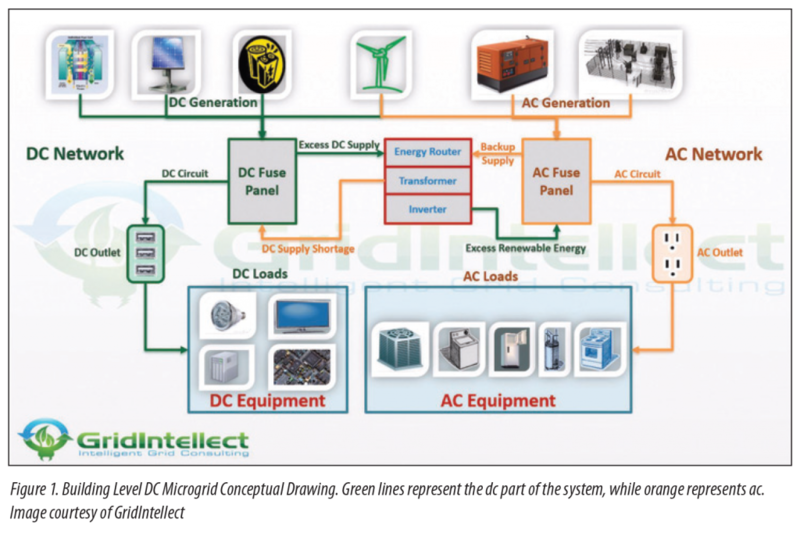 A separate DC network allows for more cost-effective battery storage system integration for the DC-only system. Rather than needing a huge bank of expensive batteries to support the entire electrical system, you may only need a handful of batteries to provide 48 plus hours of reserve energy storage. This also can provide increased resiliency to a renewables program in a typical grid-tied solution. In a single AC network solution, when the grid goes down, so does the rest of the system, regardless of the amount of solar or renewables you have available. So in a standard AC-only configuration, if you have a grid tied system, it is worthless as a backup power supply in emergency situations. The building’s AC electricity generation loads can be met by using the utility grid and/or traditional generator backup power. There will be times when the DC system cannot supply the required electricity for the DC system loads. This could be caused by cloudiness or nighttime conditions for solar panels, depleted batteries, or fuel shortages for fuel cells. During these times, the AC power behaves like a backup system, rectifying the AC power to DC, and providing the necessary DC load requirements. The MicroGrid controller used in our DC building MicroGrid is called an “energy router” and a standard for it is being discussed within IEEE. Several NEMA member companies have developed or are developing energy routers. Excess DC power supply – the energy router recognizes the excess DC supply, inverts the excess energy to AC and feeds it into the AC network. DC power supply shortage – the energy router recognizes the DC supply shortage, rectifies AC power to DC, and feeds it into the DC network. Reduced cost of renewable energy components – since the renewable energy requirements are sized to support the DC power equipment only, less renewable components are necessary. This leads to lower capital expenditure and system maintenance costs. This is the most profound advantage to this hybrid approach. Less renewable equipment, less cost, and a smaller footprint for space-constrained situations like rooftop solar. Rooftop solar becomes a very compelling (preferable) solution for climates that support good solar opportunities. Increased efficiency through reduced/eliminated power losses due to power transformations – In a standard renewable energy AC-only system, the power needs to be converted not once, but twice to power DC equipment. The DC power supply is first inverted to AC power, then transformed to DC power for DC equipment. This can lead to power transformation losses approaching 50% with most consumer products currently on the market. Also, separating the DC equipment from the grid will reduce power harmonics “noise”, improving overall power quality. Win-win for energy managers and the utility – the DC building MicroGrid system allows energy managers to utilize renewable energy resources to reduce the dependence on the utility grid by integrating renewable energy into their solution. This typically will lead to lower or stabilized energy costs for the energy managers. However, the utilities will also see value in the system since the grid-supplied power still makes up a significant portion (~70%ish) of the building power requirements. This equates to non-threatening advantages for the utility to operate in its normal business model comfort zone and also afford opportunities for implementing utility-driven energy efficiency, co-gen, or ancillary services programs. The right power for the right equipment – equipment like appliances (stove tops, refrigerators, washers and dryers, etc. ), heavy equipment, HVAC, and spinning machinery have power VAR requirements that make AC power the only choice. Devices like computers, LED lighting, and electronics do not draw heavy loads at startup, allowing DC power to be the better choice. Separating the power network into DC and AC networks allows the native power to be supplied to the devices optimizing efficiency at every level. Building reconfiguration – the building wiring will have to be reconfigured to allow for two separate networks. This could be very simple for circuits that have DC-only equipment such as LED lighting and electronics. No DC plug standard –the IEEE and Emerge Alliance are currently working on developing standards in this area. However, it is likely several years away from completion. Electronics and other DC equipment configuration – most electronics are not configured with a DC power supply solution in mind. If this concept takes off, it is likely that manufacturers will develop different versions of their equipment to support either or both AC and DC configurations. In the meantime, the equipment will either need to be connected to AC power or modified on a one-by-one basis. Proper DC power supply – the IEEE is working to develop In-Home DC standards and are quite far along with this activity. The industry is settling on 380VDC power supply for the DC network. The higher voltage is being justified due to the fast charging DC requirements for electric vehicles, although we believe lower voltages for residential and light commercial office buildings seems more practical. Although there are a number of challenges and questions still to overcome, the efficiencies gained by utilizing a DC building MicroGrid solution are quite compelling. This is especially true for rooftop solar solutions for residential and light commercial office buildings. The capital and maintenance cost reductions as well as the reasonably simple reconfiguration needs make the time for such experimentation right now. The use of this solution should become the norm for future electrical building codes in order to maximize the benefits of renewable energy, especially rooftop solar and storage. The benefits afforded by this solution as well as jobs and new innovations cannot be overvalued.